San Francisco -- July 18, 2007 -- The San Francisco International CHOCOLATE SALON today announces the 2007 Award Winners of its Chocolate Tasting Panel. The Salon, sponsored by TasteTV and TasteTV.com, welcomed over 2,000 chocolate aficionados, fanatics, buyers and journalists who enjoyed 27 of the finest artisan and premium chocolatiers, in addition to wine, beverages, and Vermeer Dutch Chocolate Cream Liqueur. 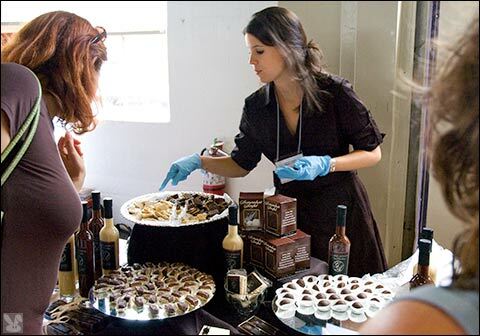 Because of the success of the first San Francisco International CHOCOLATE SALON, TasteTV also announces that it will be sponsoring the Salon again next year in July 2008, as well as in Los Angeles in October 2007. In addition, it will be launching an annual series of publications known as The Chocolate Guides, showcasing the chocolate makers, chocolatiers, bakeries and matching wines of four North American regions. The first Chocolate Guide, the Western Edition, is scheduled for publication in Fall 2007. Organic and Fair trade chocolates were well represented at the Salon, and speakers included chocolate perfumer Yosh Han, blogger Emily Stone of Chocolate in Context, Global Exchange's Adrienne Fitch-Frankel and conceptual chocolate artist April Banks, Seneca Klassen of the Bittersweet Chocolate Cafe, food writer GraceAnn Walden, and New York's Reverend R. M. Peluso, who demonstrated how to use chocolate in spiritual meditation. For more information about the San Francisco International Chocolate Salon, go to http://www.SFChocolateSalon.com. Greetings to all! Hope you are enjoying your summer! I truly am happiest this time of year because of all the glorious produce. At it's peak, just right for the picking the fruits and vegetables available right now blows my mind! Sweet and succulent corn, bright and juicy berries in shades of pink to purple, funky shaped and aromatic heirloom tomatoes, fragrant peaches, plums and nectarines, I am in heaven! Last night I taught a class at Sur La Table, in San Francisco. My "Fiesta Mexicana" menu featured farm fresh produce, jazzed up with vibrant herbs and fiery peppers. It was muy sabroso! The class was a hit, the students loved making sopes stuffed with sauteed mushrooms and queso fresco, garnished with petite pink radish and avocado. We shucked corn and made delicate flans topped with poblano puree. Crunchy jicama was tossed with tart grapefruit and crispy cucumbers to create a cool summer salad. Plump sea scallops, lime juice and mango were delicious in our ceviche served in tortilla bowls. The hit of the night was the meat! A tender tri-tip steak dusted with ancho powder, cinnamon and cocoa, then pan roasted to a perfect medium-rare. Smokey, sweet and slightly spicy, the steak was served with red onion jam and a creamy coleslaw spiked with chipotle adobo and pineapple juice. Ay caramaba...I'm hungry! The night came to a sweet ending with peaches and ginger flambeed with brandy and served with freshly made churros and vanilla ice cream. This weekend I am catering an event in Sonoma. It will be a picnic in the park, featuring my "Mod-Mex" cuisine. I have submitted my audition video to The Food Network for season 4 of "The Next Food Network Star". Check it out on my MySpace page, leave a comment, I would appreciate your support! I would love to bring my flavors to TV! Until next time, enjoy the bounty of the season, have fun grillin' and take it easy with a cool cocktail!